12 Worst Cars of 2013: 1/2 are GM/Chrysler Products – Aren’t You Glad We Bailed Them Out?! Below, we present this year’s dirty dozen with accompanying highlights where they came up short. Mitsubishi i-MiEV SE 34 Short range, long charging time, weak cabin heat, Spartan accommodations, acceleration, ride, agility, seats only four, complicated radio, headlights. Chevrolet Spark 1LT 34 Acceleration, transmission, ride, noise, front-seat comfort, driving position, controls. Dodge Avenger SXT (4-cyl.) 43 Engine noise, acceleration, braking, handling, rear visibility, transmission, driving position, fuel economy. Ram 2500 Laramie (6.7L, inline 6) 49 Ride, noise, handling, transmission, high step-in, complicated optional radio, reliability. Toyota Tacoma(V6) 50 Ride, handling, driving position, high step-in, low rear seat. In a move that cuts directly against the secretive nature of dark money political efforts, California’s campaign finance watchdog on Monday publicly released the names of the donors behind an Arizona group’s $11 million donation to ballot initiative efforts in the Golden State. Americans for Responsible Leadership, a Phoenix-based 501(c)4 nonprofit group run by an unlikely collection of Arizona Republicans, began drawing criticism from California Democrats and progressives in October, when it made the enormous donation to another group, called the Small Business Action Committee PAC (SBAC). The SBAC is opposing California’s Proposition 30, which is Gov. Jerry Brown’s tax-hike initiative, and supporting Proposition 32, which would prohibit labor unions from raising political money through payroll deductions. 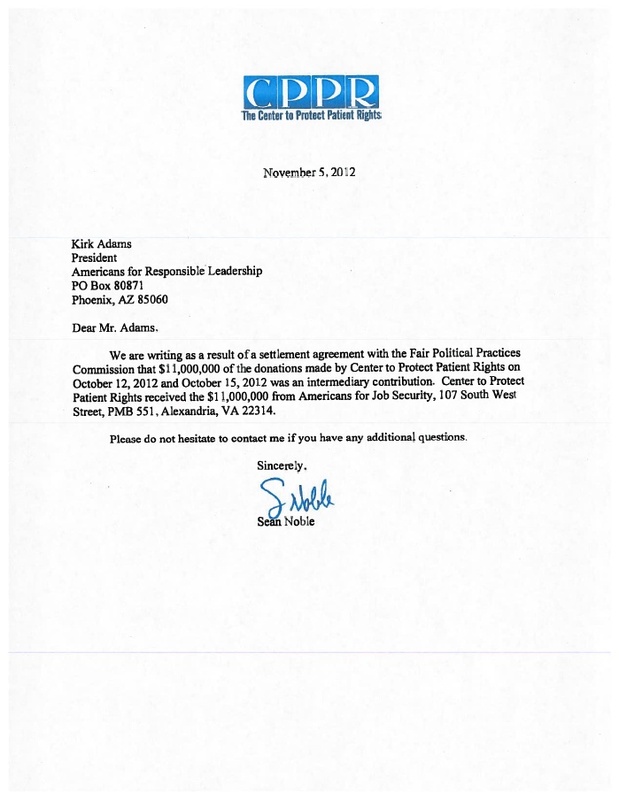 Emails to Americans for Responsible Leadership director Robert Graham, and a call to Noble’s political consulting firm, DC London, were not immediately returned. Dark money groups like Americans for Responsible Leadership, sometimes called “social welfare” organizations, are generally allowed to collect and spend unlimited amounts of money without disclosing their donors. But the FPPC began seeking records from the group late last month to determine whether the its donation complied with state disclosure laws. A legal battle over the FPPC’s audit authority quickly reached the state’s Supreme Court, which ruled Sunday in favor of the watchdog, ordering the Arizona group to turn over records. 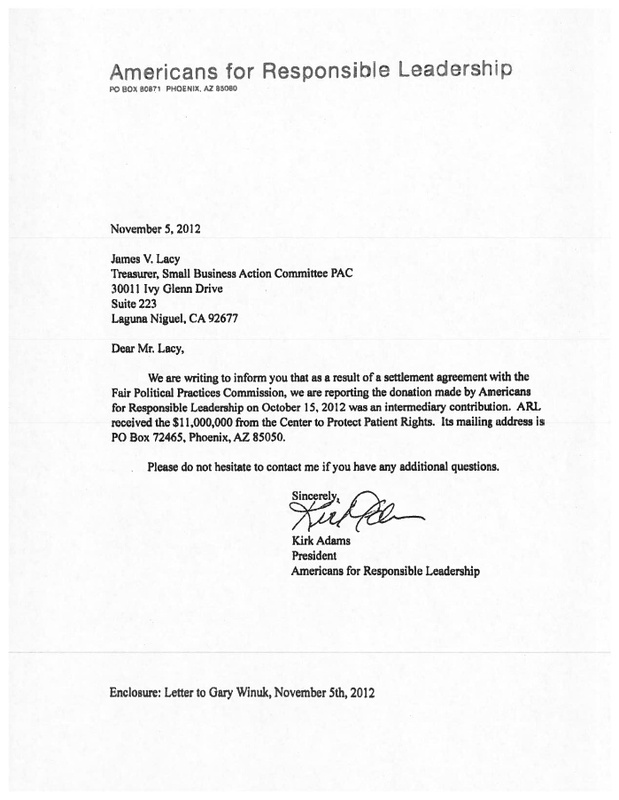 Americans for Responsible Leadership had at first indicated that it would ask the U.S. Supreme Court to block the California order. But that request was withdrawn Monday. Initially, the group’s board of directors included Graham, the founder of a wealth management firm, former gubernatorial candidate, and anti-union activist; Eric Wnuck, a 2010 congressional candidate; and Steve Nickolas, a beverage industry executive. The group’s incorporation document was signed and submitted by Cathleen West, a partner at the Washington D.C. and Virginia-based law firm HoltzmanVogelJosefiak PLLC, which specializes in providing counsel to outside spending groups, and is home to some of the most prominent Republican lawyers working today. In September, the group added two new directors: Kirk Adams, a former Speaker of the Arizona House of Representatives, who ran unsuccessfully for Congress in Arizona’s newly redrawn 5th District earlier this year; and Taylor Searle, a CPA who works for The Wolff Company, a Scottsdale, Ariz.-based real estate private equity firm. Since adding Searle and Adams (who now serves as the group’s president), American for Responsible Leadership’s spending has skyrocketed. In addition to the $11 million donation in California, the group has dropped hundreds of thousands of dollars into the battles over ballot initiatives in Arizona, and paid more than $2.3 million to companies in North Carolina and Washington D.C. for anti-Obama phone calls. Monday’s disclosure confirms the hunches of Arizona political insiders, who had whispered that Americans for Responsible Leadership’s sudden big spending was tied to the political consultant Sean Noble, whose firm had been paid $44,000 by Kirk’s recent congressional campaign. In early October, Bloomberg reported on Noble’s activities. In 2009 and 2010, Noble’s and the Center to Protect Patient Rights contributed $55.4 million to other nonprofit political groups. Among the recipients were the Iowa-based American Future Fund, which itself has spent more than $4 million opposing Prop. 32 in California, and Americans for Job Security. Back in May, The Los Angeles Times reported on the several links between the billionaire Koch brothers and the Center to Protect Patient Rights. Americans for Jobs Security, founded in 1997, is a 501(c)6 “business league,” which promotes the common business interests of its members. The group’s website says its goal is to support a “free markets and pro-paycheck public policy,” and its president is Stephen DeMaura, a former executive director of the New Hampshire Republican Party. According to figures maintained by the Center for Responsive Politics, Americans for Job Security has spent more than $15 million on federal-level elections this year, most of which has gone to oppose Obama. As a 501(c)6, the group does not disclose its donors. Those words ring with meaning. For organized labor they ring with pride, hope, and energy for the struggles ahead. No one feels like labors candidate won, so now we can go home and rest. Rather, as congratulation messages pour in from all parts of the labor movement, the critical subtext is, we are ready and eager to march with you for change. At the top of labors change agenda is boots-on-the-ground support for the Obama agenda of a new New Deal for economic recovery and passage of the Employee Free Choice Act. Its been many years since labor was so totally united behind a presidential candidate. Unions gave vital leadership in building support for Obama on issues like the economy, workers rights to organize, protecting retirees pensions and social security, healthcare, and building green manufacturing that protects the environment and puts people back to work. The labor movement took independent political action to spectacular new levels. Unions broke all previous records in mobilizing its rank and file for labor walks, phone banks, plant gate distributions, and member to member contact in the workplace. Labor continued to build and develop its own political apparatus and voice. Hundreds, if not thousands, of union halls became campaign central for the Obama campaign as well as for targeted Congressional contests. As phenomenal as labors efforts were, the impact of the Obama upsurge and campaign on labor was also incredible. New coalitions were built or strengthened. A new depth was added to ties between labor and all the components of the Obama movement. Labors role was hardly mentioned in the mainstream press. All the more reason for labor to have a big showing of celebration and support for our new President. Some in labor have begun to talk about a big mobilization for President Barack Obamas Peoples Inaugural. WASHINGTON (AP) — There’s a new push to make testing for the AIDS virus as common as cholesterol checks. Americans ages 15 to 64 should get an HIV test at least once — not just people considered at high risk for the virus, an independent panel that sets screening guidelines proposed Monday. Yet not nearly enough people have heeded that call: Of the more than 1.1 million Americans living with HIV, nearly 1 in 5 — almost 240,000 people — don’t know it. Not only is their own health at risk without treatment, they could unwittingly be spreading the virus to others. The updated guidelines will bring this long-simmering issue before doctors and their patients again — emphasizing that public health experts agree on how important it is to test even people who don’t think they’re at risk, because they could be. “It allows you to say, ‘This is a recommended test that we believe everybody should have. We’re not singling you out in any way,'” said task force member Dr. Douglas Owens of Stanford University and the Veterans Affairs Palo Alto Health Care System. And if finalized, the task force guidelines could extend the number of people eligible for an HIV screening without a copay in their doctor’s office, as part of free preventive care under the Obama administration’s health care law. Under the task force’s previous guidelines, only people at increased risk for HIV — which includes gay and bisexual men and injecting drug users — were eligible for that no-copay screening. There are a number of ways to get tested. If you’re having blood drawn for other exams, the doctor can merely add HIV to the list, no extra pokes or swabs needed. Today’s rapid tests can cost less than $20 and require just rubbing a swab over the gums, with results ready in as little as 20 minutes. Last summer, the government approved a do-it-yourself at-home version that’s selling for about $40. —People at very high risk for HIV infection should be tested at least annually. —It’s not clear how often to retest people at somewhat increased risk, but perhaps every three to five years. —Women should be tested during each pregnancy, something the task force has long recommended. “We are not doing as well in America with HIV testing as we would like,” Dr. Jonathan Mermin, CDC’s HIV prevention chief, said Monday. “It can sometimes be awkward to ask your doctor for an HIV test,” Mermin said — the reason that making it routine during any health care encounter could help. But even though nearly three-fourths of gay and bisexual men with undiagnosed HIV had visited some sort of health provider in the previous year, 48 percent weren’t tested for HIV, a recent CDC survey found. Emergency rooms are considered a good spot to catch the undiagnosed, after their illnesses and injuries have been treated, but Mermin said only about 2 percent of ER patients known to be at increased risk were tested while there.